Digital tools that are rapidly altering the nature of how jobs are found and filled in America and across the globe. Timeless know-how and savvy developed by the best employment giants over decades. Don’t think the digital age is just for the young. In fact, the number of people in the 55- to 64-year-old age bracket using social media has grown by 79 percent in the past few years with sites such as Twitter. New technological ideas standing on the shoulders of historically proven smarts are a winning combination. Technology changes in a decade; human nature doesn’t. Reset your concept of what you must know about resumes in the job chase. Writing great resumes is no longer enough. You must know how to distribute those resumes to people who can hire you, or at least can move you along in the process. Job seekers, brace yourselves: Navigating the job market is getting ever trickier and requires considerably more effort than the last time you baited your resume hook — even a short five years ago. The generic resume is at the top of the list of job search tools on the way out. You probably have an all-purpose resume lying around in a desk drawer somewhere. What legions of job seekers everywhere like about the all-purpose resume is that it casts a wide net to snag the attention of many employers — and it saves time for those who are too busy to write different resumes for different jobs. But your one-size-fits-all work of art is obsolete, and it’s getting lost in more and more recruiting black holes. The Core resume has been replaced by the targeted resume, a customized resume tailor-made for a specific employment opportunity. Addresses a given opportunity, showing clearly how your qualifications are a close match to a job’s requirements. Uses powerful words to persuade and clean design to attract interest. Plays up strengths and downplays any factor that undermines your bid for an interview. The word got out, slowly at first. And then — whoosh! — millions of job seekers found out how easy it is to instantly put an online resume in the hands of employers across town as well as across the country. Post and pray became the job seeker’s mantra as everyone figured out how to manipulate online resumes and upload them into the online world with the click of a mouse. Resume overload began in the first phase of the World Wide Web, a time frame of about 1994 to 2005. It became exponentially larger and more frustrating as commercial resume-blasting services appeared on the scene. Almost overnight, it seemed, anyone willing to pay the price could splatter resume confetti everywhere an online address could be found. The consequences of resume spamming for employers were staggering: Despite their use of the era’s best recruiting selection software, employers were overrun with unsolicited, disorganized generic resumes containing everything but the kitchen sink. And what about the job seekers who sent all those generic, unstructured resumes? They were left to wonder in disappointment why they never heard a peep from the recipient employer. The answer’s in the numbers: A job advertised online by a major company creates a feeding frenzy of many thousands of resumes. Employment databases are hammered with such mismatches as sales clerks and sports trainers applying for jobs as scientists and senior managers, and vice versa. Even when you use your OnTarget resume to apply to opportunities you find posted online, don’t hold your breath. Popular job boards can have as many as 40,000 new resumes uploaded every day. Choose the resume format that fits your goals and situation. What goes where in a resume isn’t a one-size-fits-all consideration. Get your points across in powerful language. Make your strengths stronger by describing results in vibrant language that stands tall. Use design techniques effectively. Big chunks of text cause eye strain. Present your information in a way that enables readers instead of inhibiting them. Overcome hurdles. Getting attention from potential employers is harder in certain situations. See your resume as a reverse funnel. Your funnel starts out very narrow to match the job you’re targeting. Then it expands with your summary to show how you stand out from the competition. Next your resume further expands to encompass all the requisite skills you possess to fit the position. Finally, it ends with the large base of the funnel showing your relevant employment experience using those skills and producing those results. Begin with the position you are targeting. Add an overview of the strengths that make you a perfect fit for the job. List the key skills you have for the position. Your employment history section provides proof that supports the objective, summary, and keyword sections. 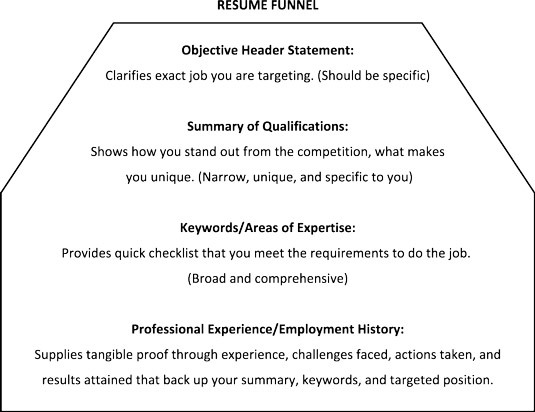 Use the reverse funnel method to write your resume and strategically present yourself and your qualifications.